Our range of products include Tilt-in-Space Wheelchairs such as Tilt in Space Reclining Wheelchair, Manual Tilt-in-Space Wheelchairs and Powered Tilt-in-Space Wheelchairs. We are one of the leading manufacturers of Manual Tilt-in-Space Wheelchairs in Chennai, Hyderabad,Banglore and Kerala. The range of Manual Tilt-in-Space Wheelchairs is offered to the clients at highly competitive prices. 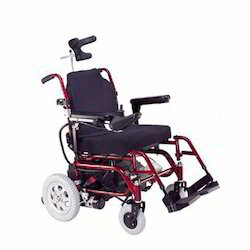 These wheelchairs are manufactured using high-grade raw material procured from some of the most trusted vendors of the market. Our range of Manual Tilt-In-Space Wheelchairs is widely used by spastic children and the people suffering from spinal cord problem, paralysis and others. 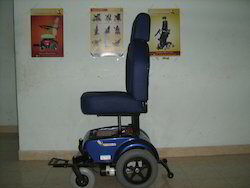 We are one of the leading manufacturers of Seat Up Down Wheelchair in Chennai, Hyderabad, Bangalore and Kerala. We provide Seat up down wheelchair which is useful to transfer from bed to chair, chair to car. You can elevate seat height from the range of 21 inches to rise up to 27 inches. Rising seat position can be stopped at any height range. It can withdraw up to 250 kg. This seat up down wheelchair mechanism is available for all types of wheelchairs including foldable wheelchair. Fold-able wheelchair has the removable seats. The seat can removed and the wheelchair can be folded. Both push button and toggle Switch is available for moving the seat up and down in the wheelchair. The height range varies from a minimum of 4 inches to 24 inches. We are one of the leading manufacturers of Powered Tilt-in-Space Wheelchairs in Chennai, Hyderabad,Banglore and Kerala. 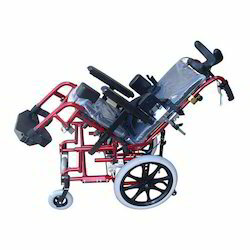 Offered by us are high quality Powered Tilt-in-Space Wheelchairs to the esteemed customers as per their requirements. These wheelchairs are especially designed for the patients having spinal cord injury or paralysis. Moreover, wheelchairs can be tilted up completely without any problem by tilting the position of the lock. 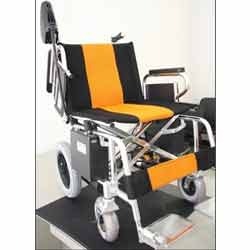 We are one of the leading manufacturers of Tilt in Space Reclining Wheelchair in Chennai, Hyderabad, Bangalore and Kerala. 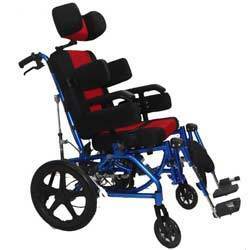 We have gained expertise in offering excellent Tilt in Space Reclining Wheelchair to the esteemed customers. Our range has foldable tilt, which gives it an appearance of bed wheelchair. Moreover, we provide the facility of customization to meet different needs of the esteemed customers perfectly. We are one of the leading manufacturers of Lightweight Aluminium Power Wheelchairs in Chennai, Hyderabad,Banglore and Kerala. We have gained expertise in offering genuine quality Lightweight Aluminium Power Wheelchairs to thecustomers. These wheelchairs are designed and manufactured by employing technologically advanced facilities that are available at our state-of-the-art infrastructure. Moreover, these wheelchairs are operated with the help of battery. Looking for Tilt-in-Space Wheelchairs ?